Ask any smart phone user if he or she has a favorite app, and they will probably tell you they have several. For those who enjoy a great meal, finding area restaurants that use locally grown ingredients is about to get a lot easier. 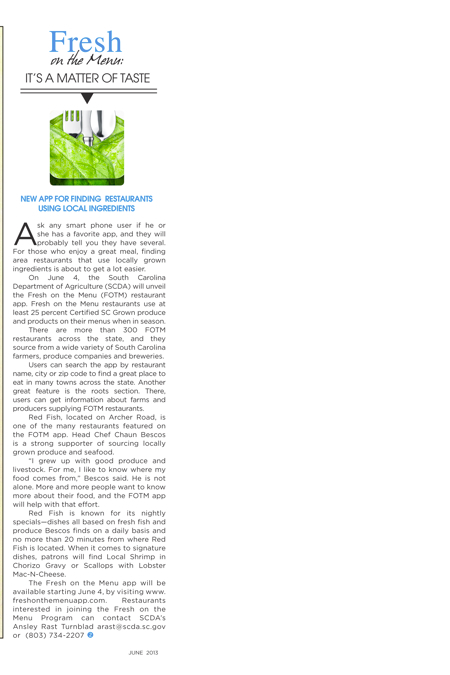 On June 4, the South Carolina Department of Agriculture (SCDA) will unveil the Fresh on the Menu (FOTM) restaurant app. Fresh on the Menu restaurants use at least 25 percent Certified SC Grown produce and products on their menus when in season. There are more than 300 FOTM restaurants across the state, and they source from a wide variety of South Carolina farmers, produce companies and breweries. Users can search the app by restaurant name, city or zip code to find a great place to eat in many towns across the state. Another great feature is the roots section. There, users can get information about farms and producers supplying FOTM restaurants. Red Fish, located on Archer Road, is one of the many restaurants featured on the FOTM app. Head Chef Chaun Bescos is a strong supporter of sourcing locally grown produce and seafood. “I grew up with good produce and livestock. For me, I like to know where my food comes from,” Bescos said. He is not alone. More and more people want to know more about their food, and the FOTM app will help with that effort. Red Fish is known for its nightly specials—dishes all based on fresh fish and produce Bescos finds on a daily basis and no more than 20 minutes from where Red Fish is located. When it comes to signature dishes, patrons will find Local Shrimp in Chorizo Gravy or Scallops with Lobster Mac-N-Cheese. The Fresh on the Menu app will be available starting June 4, by visiting www.freshonthemenuapp.com. Restaurants interested in joining the Fresh on the Menu Program can contact SCDA’s Ansley Rast Turnblad arast@scda.sc.gov or (803) 734-2207.